To begin with, no the picture was not taken from today's race. 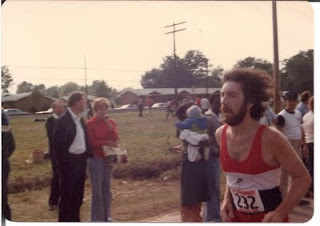 This was from 1979, 30 years ago and at 32 years running this is one of the oldest races in NC. It was originally a 10K which was the most popular race distance back in those days. I don't remember when it was changed to 5k and it seems they had both for a while. I was proud that my Mother and I think my brother also ran the race that year. Dad took the picture. It remains a small, low-key event with a reasonable entry fee. But it is a very flat fast certified course with chip timing and is the place to go if you want a fast time. The last time I ran here was in 2005 when Karla and I were training together to get ready for Boston. She had already qualified and was running to try for a pr while I was using it for a test of my leg speed. Her husband Frank and our friend Jerry would also be running. I had a great day and ran 21:12, my fastest 5k in almost 20 years and Karla ran a pr or was within a second or two and won 2nd place in her age-group. So here we are now 4 years later with the same goals. After going through cancer and recovery I felt that Karla with her hard training this year was about back in shape to try for another pr. I am not quite back to the same level as 2005 but was hoping to have a good test of my speed work and to at least come close to my time 4 years ago. Frank would be running again also. We were also happy to have our friends Margo and Maureen as surprise entrants. I was not surprised to see some other running friends Katie Leger and Laura Frey show up. They have been running great lately and the lure for a flat fast course was enough to get them to come and attempt to run pr sub-20 pace. It turned out to be a warm and muggy morning but we still hoped for the best. I got off to a good start hitting mile 1 in 6:53 but I would began to slow quickly. My legs felt great but I have been trying to fight off a cold this week and my lungs just weren't up to the pace today. I could see Katie and Laura were leading the womens race and soon after I made the u-turn I could see Maureen not too far behind me and Margo just behind her. I passed the 2 mile mark 14:22, a 7:29 2nd mile and I knew my hoped for sub-22 was not going to happen. I soon saw Karla go by and could tell she was really close to the pace she needed. I tried to maintain and push the pace the last 1.1 but it was hard and I got a side stitch with 1/2 mile to go. Maureen passed me with 1/4 to go looking strong. She's an amazing athlete and did this with very little running this year. I finished in 22:43, about a minute faster than The Race for the Cure in June so I am making some progress at least even when not having my best day. Margo was not too far behind me and then Karla came in just missing sub 24 but still got her pr by about 5 seconds !!! Can you tell how proud I am !!!!! After all she had gone through in 2006 to be back stronger than ever is AWESOME ! The awards ceremony was good. Katie and Laura finished 1-2 overall women. Maureen was 2nd in the 30-39, Margo was 3rd in 40-49 but too bad they only go 2 deep. Karla was 1st in 50 and over. Another friend, Brent George won the mens 30-39 and Sean Kurdys won the mens 40-49. Frank and I settled as also rans in ours, both finishing 5th I think. 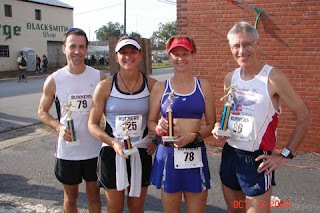 Overall it was still a fun day and afterwards Karla and I ,still in OBX training mode went out for a 10 mile run.